You joined the club (Port Vale) in 1949 - I understand your brother George persuaded you to take a chance at Vale Park. Can you explain how you came to join the club? My joining Port Vale came about in quite a remarkable and, at times, painful and exasperating way. Prior to that memorable day when I put pen to paper in the presence of Gordon Hodgston and club chairman, Mr Holdcroft, I was pretty much on the scrapheap as far as professional football was concerned. 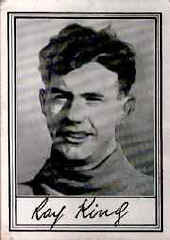 I'd played as a seventeen-year-old for Newcastle United, my 'local' club with my debut a derby game against Sunderland! I quickly established myself as their first Team goalkeeper and at the time was being touted as a future England keeper. However, there was a slight interruption to my playing career in that I was called up for National Service (this during the Second World War) and I joined the army, at eighteen. That interruption lasted some four and a half years - a long spell out of the game in any player's career. I did manage to play again for Newcastle United, in 1945 after hostilities had ceased (and I'm not talking about the derby matches!). I had also been a 'guest player' for Chester in wartime regional football games and these were of considerable significance for a variety of reasons, not least because they afforded me an opportunity to play against greats such as Tommy Lawton and Stanley Matthews. Unfortunately, saving a penalty taken by Tommy Lawton resulted in a broken wrist, the first of such injuries which by rights should have put me out the game for good. I was a stubborn bugger, though! I also suffered a double fracture of the jaw on another occasion, so the likes of Roy Keane are perhaps following in a dishonourable tradition! The player who inflicted that particular damage upon me approached me years later, revealing that he had been given specific instructions from his manager to "put Kingy out of the game". Regrettably, this particular incident occurred in my first match back in goal after being out for three years. It was a disaster for me. It seemed that I'd finally reached the point where I must bow to the inevitable and kiss goodbye to a career which had begun full of promise. I did find myself eventually back on the pitch for my local team, Amble, who played in the Northern Alliance, but it was as a full back, centre forward or any other position except goalkeeper. It was during this period that Ashington (home of Jackie Milburn and the Charlton brothers) were looking for a keeper and they invited me to play for them. Again I hadn't been between the posts for some years due to those numerous injuries and I was somewhat anxious about how I'd cope physically. Nevertheless I decided to risk it. I ended up playing a couple of games in their second Eleven, which was not exactly an awe-inspiring experience and I was hardly Ray King, future England goalkeeper. But fate again played its hand, this time more favourably. Ashington manager Jimmy Denmark, a former Newcastle centre-half, sent me a telegram instructing me to report to Roker Park, Sunderland's football ground, that coming Saturday. The Ashington First Team keeper had taken ill and so there I was, in at the deep end against a Sunderland team whose players all made regular 1st Division appearances (often the Northern Alliance served as a good run-out for players not able to find a place in the first Elevens of their League sides). As I ran out onto that splendid pitch at Roker Park, soaking in the atmosphere, I realised just how much I'd missed those St James's Park crowds of fifty to sixty-five thousand-plus. It was like returning 'home'. Ironically, Sunderland had been my first opponents with me as a 'Big Time' goalkeeper and, as it turned out, it was the Black Cats who played me back into that same 'Big Time'. The confidence which I'd always had in abundance as a keeper flooded back to me at Roker Park and it was as though I'd never been away. My brother George was playing for Port Vale at the time, having previously been a centre forward with Newcastle United and Hull City. He happened to mention me to Vale's manager, Gordon Hodgston, who informed George to get me down to the Potteries immediately. Gordon wanted me to play in the final of the Staffordshire Senior Cup at Hanley. Of course, I thought I was dreaming but off I went and Gordon duly signed me up before the game, despite not having seen me play! He told me: 'Ray, you'll do for me!" Winning the game against Walsall was an added bonus. It had been a sometimes tortuous route but I was back where I felt I really belonged. The modern game sees some goalkeepers marshalling forces and directing traffic, even taking penalties. Was that ever a part of your role and responsibilities? Or did the manager do all of that? Certain aspects of the goalkeeper's game have changed and new rules have improved the flow of the game, especially in relation to the back-pass and running with the ball before its release. In my day we were subject to some hefty physical challenges though I should say that I relished the rough-and-tumble (except when I ended up in hospital). It has long been my opinion that in some ways a goalkeeper is the most important player in a team. He can see the whole field of play in front of him allowing him the opportunity to marshall his forces and, to some degree, direct operations, as Barry suggests. When I talk to aspiring young keepers today I tell them that making brilliant saves is only one aspect of a keeper's game and that the most important responsibility of a goalkeeper is to control his eighteen-yard area. He must be brave and display sound positional sense, knowing when to come off his line to take crosses, either handling cleanly or punching away with aggression. A goalkeeper has a love-hate relationship with the ball, caressing it into his safe keeping or punching it away as if in rejection. I often used to go outfield to take free kicks and I also quickly learned how effective throwing the ball speedily out to a player could turn a game and put our team in a threatening position. These were useful strategies and I considered it an important part of my role to turn defence into attack as effectively as I could. Nobody taught me these aspects of the goalkeeper's game - it was instinctive and learned through experience. In fact I was never ever coached, and I believe natural ability is paramount in a goalkeeper. Personally, I believe that modern goalkeeping coaching practices have done more harm than good.